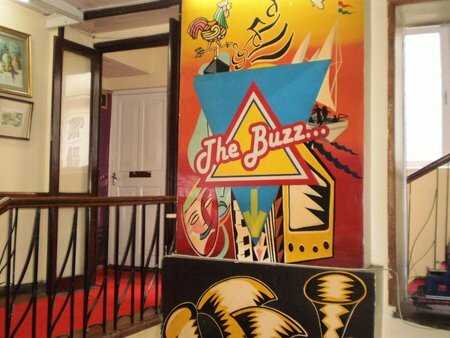 The Buzz is a modern pub and a bar located on Nehru Road and at the basement of Glenary's. It's part of Glenary's and owned by the same Edwards family that runs the bakery and the restaurant in the same building. You can access The Buzz bar from the bakery at the ground floor or take the separate entrance from the right side of the building. 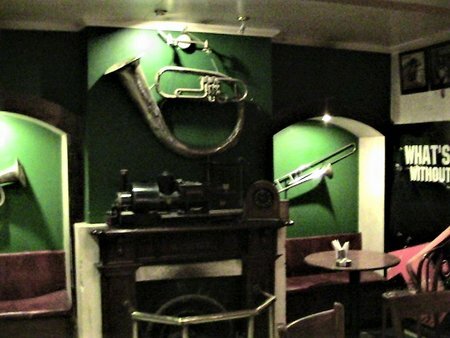 You will need to climb down the carpeted wooden staircase to the level below and reach the bar. Along the way you will see large comical models of funny characters that sets up the mood for this vibrant bar. On the staircase there are large cartoon pictures of Elvis Presley and Ann Margret. As you enter, right in front is the semi circular bar counter with high wrought iron bar stools. I have seldom seen people sitting on the stools though. Most prefer to take tables at the seating area on the right or at one of the small cabins on the left. It's only when the seating area gets full (mostly on the week ends) when you will see people sitting on the bar stools right in front of the door. The ceiling of the Buzz Bar is wood finished. Like in a typical pub, loud music is playing all the time. There was a time when live music was played by local bands. There are strange models and structures that are hanging from the walls like a huge saxophone, a wheel cart and models of vintage cars and many such things. There is also a nice model of a toy train kept on top of a fire place. Comfy sofas are laid out at the corners with small tables. The over all ambience is somewhat Hollywood themed. You will see lots of young people in the pub. As you walk across to the right, there are several sections of seating areas on an elevated platform that are separated with low fences. On the left side of the bar counter, there are four small cabins that have tables with chairs. These are meant for those who are looking for some privacy. Cabins have huge mirrors on the walls facing the doors. There are framed pictures hanging from the exterior walls these cabins. The bar is well stocked with different types of Indian and foreign liquors and cocktails. You wwill get Continental, Indian and Chinese dishes. 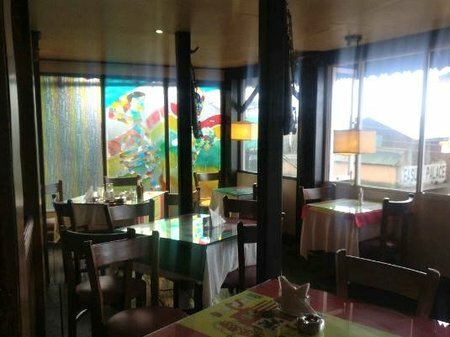 The food is same as that of the restaurant located in the upper floor. They both share a common kitchen. You will find the kind of food and drinks offered by The Buzz in the link Glenary's Restaurant where I have discussed both food and bar menus in detail. My overall impression about The Buzz Bar? Well, with dimmed lights and loud music it's no different from any other typical city pub of its class. It is an upscale polished pub & bar, at least by Darjeeling's standard. However the service in the hill town in general is somewhat below the expected professional level. Secondly the bar area overall appears to be a bit crammed. You would wish there were a little more space. However this may have been purposely done by design. Another thing that I have noticed while climbing down the carpeted stairs, the red carpet is torn at places. This shows the lack of maintenance which is not expected in a quality pub & bar like this. Overall it's quite good though. 4pm to 11pm. They accept credit cards. The Buzz Bar is a partner of Darjeeling Tourism Card and offers attractive discounts to card holders on food as well as bar items. 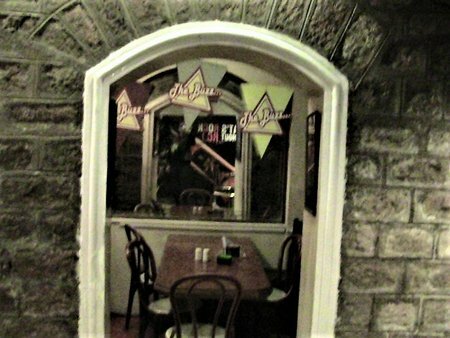 The Buzz is located on Nehru Road and at the basement of Glenary's. As you walk along Nehru Road that leads to the Chowrasta Mall, you won't miss this two storied white building on the left.